After a tough run out in the countryside, I needed and felt like I deserved a a treat, but I was hungry so wanted in quickly . 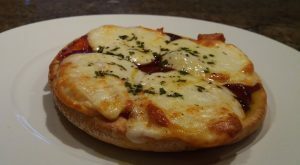 So, I used the air fryer and some basic ingredients to make a pizza style dish on a pita bread. Of course, you could make this even more delicious by adding your favorite toppings.